The emergence of dietary supplements and fortified foods is both felicitous and thought-provoking: while it helps us achieve a better nutrition, it brings into our attention the worrisome fact that our fruits, nuts, vegetables and grains are becoming less and less nutritious by the decade. So our foods are not as nutritious as they used to be. So what? Do we really need to meet our daily intake of vitamins and minerals every single day? Well, yes. 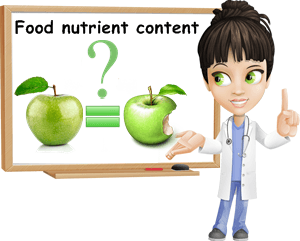 The problem with the decrease in the nutrient content of our foods is a matter of great concern as we can no longer accurately predict how much of something we should eat to achieve a well-balanced diet, suited to our body’s needs. As a result of this unfortunate situation, achieving a healthy diet may prove difficult, leaving us at great risk for nutritional deficiencies that may, in time, engender various health problems. 1) Soil depletion. Overall bad farming methods have contributed to a significant reduction in soil fertility. We are basically wearing out our soil by using whatever method necessary to ensure the survival of every single seed planted in a given strip of land, whether it hurts the earth or not. Aggressive farming methods affect soil fertility immensely and, in time, reduce the nutrient supply available to crops. Just as we don’t grow and develop harmoniously if we do not enjoy a proper nutrition, neither do plants. Soil organic matter, simply known as humus, is pivotal for yielding good crops (both high yield and ‘quality plants’). Humus basically stores nutrients for the plants to use, most of which come from decomposed plants and animals. But modern agricultural practices do not allow for such natural events to take place on the land. Moreover, most commercial crops do not use organic manure or green manure, relying heavily on chemical fertilizers to enhance soil fertility and pesticides to increase yield by killing the predators of certain species. Over-tilling is another agricultural practice that depletes the soil of essential nutrients because it compacts soil, making it inadequate for planting, while planting the same crop year after year removes certain nutrients from the soil without giving it the time and chance to replace them, resulting in depletion. Such practices and many similar ones prevent natural processes from taking place, sacrificing the quality of a crop for the sake of higher, more profitable yields. 2) Pesticide use. When we use chemical and biological substances such as pesticides to kill off weeds or insects, we are doing more than just ensuring the survival of our crop: we are also poisoning the earth. We seem to forget that the land takes in all that we put into it and gives it back to the plants it feeds. So how can we eat something grown on a poisoned land and still expect for it to be good for us or as nutritious as the foods our great-great-great grandfathers ate when farming was done the natural way? Pesticides may be deemed necessary to ward off fungi, insects, nematodes, slugs, snails or small rodents aspiring to also feed off our lands and crops, but if they are so successful at killing or impairing living beings such as ourselves, how can we allow them on our foods and remain cool about it? Moreso when the pretence of using only small amounts of such poisons has been debunked. 3) Pollution. If you stop to think about it, pollution affects the nutritional value of our foods more than we can possibly imagine. First of all, modern agricultural practices such pesticide and chemical fertilizer use as well as the use of agricultural machinery pollute our lands. Chemicals fertilizers and pesticides, for instance, release dangerous, poisoning, potential carcinogenic substances into the soil and water sources supplying the land and the crops it holds. Plants absorb part of these harmful substances along with nutrients from the soil, while the rest pollutes the soil and water supply that may even reach us. And then there is the issue of fruits, vegetables, nuts, seeds, spices, herbs or grains sold in open spaces in larger cities. Air pollutants such as exhaust gases or volatile organic compounds such as benzene, xylene or toluene may attach to or even penetrate foods with a thin, edible skin (think about berries, apples, spices, whole grains). Purchasing foods kept indoors, far from air pollutants is advised. So not only are we eating foods that are absorbing part nutrients, part pollutants from the soil, we are also exposing them to pollutants prior to consuming them (from car exhaust fumes, for example), so we get an even higher intake of harmful substances and less nutrients to help our body get rid of them. 4) Breeding plants for yield. Breeding plants for yield focuses on selecting and breeding plants with special traits such as resistance to certain pests, increased shelf-life and other similar, commercially-desirable characteristics. But because you can breed only one trait at a time, you are more likely to get bigger, more beautiful fruits and vegetables instead of more nutritious ones. After all, profit is obtained by filling the eyes with joy and the stomach with volume rather than the body with nutrients. There are instances however when the result was not only bigger and more beautiful, but also healthier. Breeding carrots to be as orange as possible has led to a significant increase in their vitamin A and carotenoid content, making them a lot healthier than they used to be. Similarly, the newly-bred purple cauliflower is full of powerful anthocyanins. But these are but felicitous accidents that do not apply to all commercial crops. Not to mention the fact that soil depletion, pesticide use and pollution render all foods less nutritious. Despite not leading the headlines, the fact that our foods are less nutritious than they used to be remains an issue that should be dealth with promptly as it affects our health immensely in the long-run. Higher yields have become a priority as a result of overpopulation, but fail to meet the most basic of needs: ensuring an adequate nutrition. While we fear starvation and strive to eradicate it, we fail to understand that the aggressive and invasive agricultural practices we rely on today will lead to our extinction, who knows, maybe even in the form of insufficiently nutritious foods. Not to mention that adopting crops from other countries or continents for the sake of increasing food resources may introduce new pests to ours, putting existing crops at a higher risk and disrupting fragile ecological balances.